We've had a relatively dry week so far as the only measurable rainfall for Memphis came this past Sunday. While we have kept those afternoon showers away, they have allowed temps to reach above average and continue to rise as we head into the weekend. The big story for today and tomorrow will be our Heat Index values. 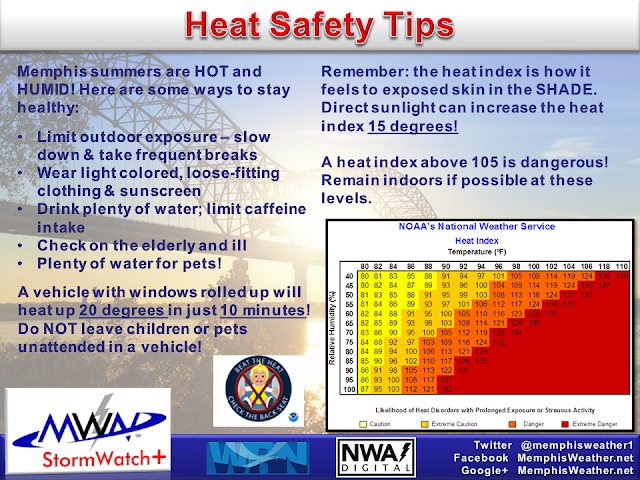 Our local NWS has placed all of our area under a Heat Advisory since most of us will experience heat index values in the 105 to 110 range in the afternoons and early evenings. Be sure to stay cool and hydrate over the next few days. Limiting long term exposure and taking breaks will help given these temperatures. Latest observations show that we have already reached the 90 degree mark for today. Taking a look at the current satellite imagery, we appear to be under a nice bubble of clear skies, which will allow our temps to continue warming into the afternoon. You may notice some clouds to our north that are generally moving our direction. This may provide some relief this afternoon from our warm temps, but may also introduce some shower and thunderstorm activity. 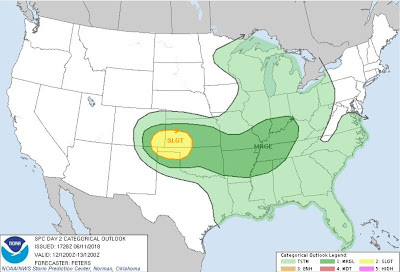 With any thunderstorms that develop, there is the possibility that some may become severe. For this reason, we are included in a Marginal Risk from the Storm Prediction Center. Truthfully, showers/thunderstorms are a possibility, but any that develop should remain fairly isolated. I would not let this small chance discourage you from participating in any fun, outdoor activities today like the Patriotic Pops. We will be keeping an eye on things for you if showers develop, but overall the biggest concern for today is the heat, so stay cool out there! Into the evening hours tonight, things will stay fairly warm. The sky should remain mostly clear, which is good news for all of those heading out to see the Patriotic Pops. Overnight temps will only fall into the upper 70s, so not expecting much temperature relief. Tomorrow appears to be a cut and paste copy of today, with highs reaching around 97. Precipitation chances will remain isolated for the area under a partly cloudy sky. Heat index values will be in the 105 to 110 range again. By this weekend, it will still be hot, but temps do appear to back off a degree or two. Highs will be in the mid 90s and with dew points still coasting in the 70s will allow heat index values to be near 100. The good news for the weekend is that a high pressure system will continue to build into the eastern half of the U.S., which should keep afternoon showers and thunderstorms fairly isolated. Taking a look into the middle of next week, things actually appear to be setting up nicely for the fourth of July holiday. We still appear to be under a high pressure by then, but temps do look like they may back down a bit by Wednesday. It will still be hot with highs in the 90s over the two days, but highs will probably stay in the low 90s compared to the upper 90s we've seen recently. This sets up for some pretty nice BBQ weather if you ask me. As for our overnight temps, our lows appear to stay in the mid 70s. This will provide a little relief from the daytime heat, but still pretty warm for any firework viewing Tuesday and Wednesday. Really the big question I'm sure many of you have is this: is it going to rain? Well, just like any good, summertime forecast, it is a bit complicated. Given the overall set-up, it does not appear like the third or fourth of July will have any kind of washout, which is good. Right now our medium-range models do vary in terms of precipitation though. The GFS wants to bring some scattered showers and thunderstorms on Tuesday, while the Euro keeps us dry. For the fourth, the GFS has some showers and thunderstorms in the area during the day, but has us fairly dry by the evening. With all of this in mind, and the weather set-up, I do think it is possible to have some scattered afternoon showers and thunderstorms. Luckily, these will likely be driven by daytime heating, so once the sun goes down, any thunderstorm that develops should quickly die out, which would leave clear and perfect viewing conditions for any evening firework displays! But first we have Tuesday, which will be very similar to Monday. Another day with high temperatures in the lower 90s, heat indices near 100 degrees, and scattered clouds and isolated thunderstorms. Most of us stay dry at least one more day, but then the pattern changes as a ridge of high pressure aloft break down. The forecast upper level pattern (at roughly 18,000' above ground level) from Monday night through Saturday night is shown above. Notice the "hill" (or ridge) produced by the black lines over the Mississippi Valley at the beginning of the loop is replaced by a "bowling ball" of concentric circles as the loop progresses, then flattens out at the end of the loop. What happens is that the high pressure ridge is squashed by a fairly strong upper level low pressure system (the bowling ball) that moves by to our north. The proximity of the low pressure center means a fairly marked uptick in cloud cover and rain chances as it approaches and passes by. With southerly wind at the surface, the energy associated with that low will tap into a good amount of Gulf moisture, triggering the likelihood of showers and thunderstorms from mid to late week. 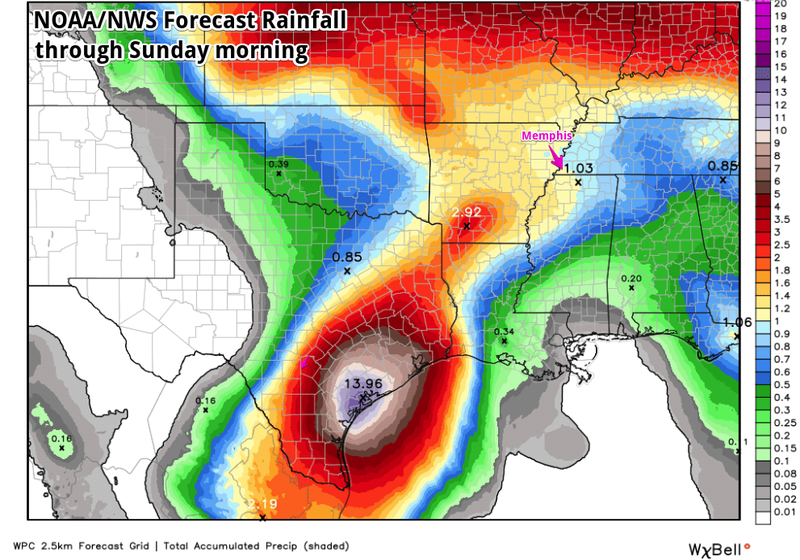 In addition, a semi-tropical system that will bring torrential rain to parts of the Texas coast the next few days will also contribute moisture to this system. We are left with a very different weather pattern for Wednesday-Friday than we have seen in some time - one that features abundant cloud cover and high rain chances, thereby resulting in cooler (though still humid) conditions. I think we'll take some mid/upper 80s and clouds versus the low/mid 90s and sunshine of late (at least for a couple days)! We'll need to closely monitor the potential for severe weather, as thunderstorms are expected at times during this period. I believe those chances will be fairly minimal though due to the cloud cover which will limit instability a great deal. A few strong wind gusts or hail could be possible at times in stronger storms though. The flash flooding threat will also be monitored, though I expect that also to be fairly low. All of these threats will be refined on a daily basis and communicated through our social media channels, so be sure you are following MWN on Facebook and Twitter and have downloaded our mobile app for the latest details. 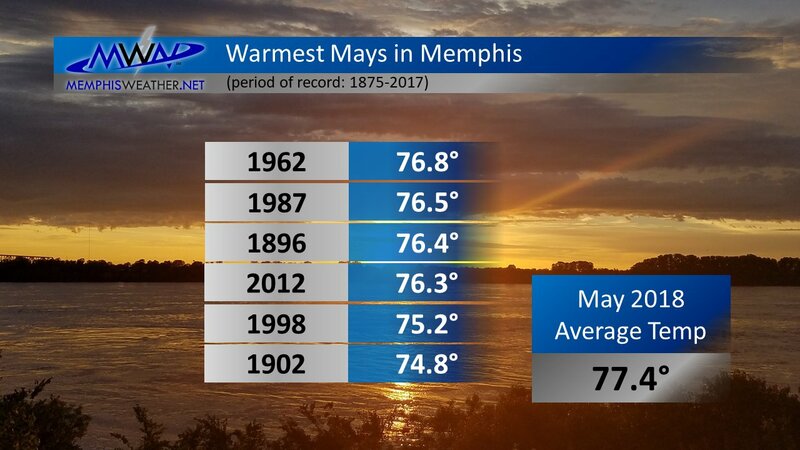 After an April that will be remembered as the third coldest on record, averaging over six degrees below normal, May flipped the script and went into the record books as the warmest on record, nearly six degrees above the long-term average! The average temperature for the month was over 21 degrees warmer than April. 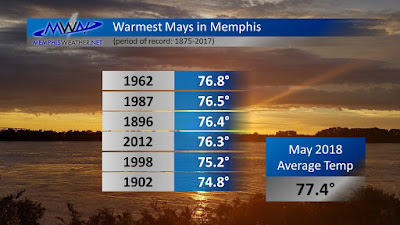 Averaging the first five months of the year together, Memphis is right at "normal" year-to-date, which just goes to show you that there is no such thing as normal! Three May days saw high temperatures set or tie their daily records, while only a single day (the 5th) recorded a below average daily temperature, and that was by a single degree. The warmth began when the calendar turned to May and was persistent. Officially, precipitation for the month was below average by nearly two inches, however scattered thunderstorms on several days resulted in a wide range of precipitation amounts. As an example, MWN in Bartlett recorded nearly 3" more rain than the airport from localized deluges under these storms. Severe weather was not widespread, though a few of the scattered "summertime" cells that formed in the May heat produced severe reports. Hail fell in Shelby County on the 19th and 20th and there were wind damage reports in Crittenden County (20th) and Tate County (31st). There were multiple Severe Thunderstorm and Flash Flood Warnings during the month in the metro, but no Tornado Warnings. Most Flash Flood Warnings were in Shelby County for urban flooding from localized heavy downpours. Records set or tied: The month was the warmest May on record. Record high temperatures were set on May 14 and 15 (both 93°). A record high temperature was tied on May 10 (90°). Comments: Eight days recorded high temperatures at or above 90 degrees, which is 6 days above average. The May average temperature was more than 20 degrees warmer than the April average temperature. Comments: Only a single day recorded more than 1.0". Summer "officially" starts 6 days from today, but Mother Nature has decided to bring on the full-on summertime pattern to our area early. This weekend into next week, our forecast pattern will be primarily influenced by a high pressure that has developed over our area. This high pressure will keep our rain chances to a minimum, but will allow our temps to reach around 5 degrees above average for mid June. Main story lines will be our poor air quality and dangerous heat index values through the weekend. 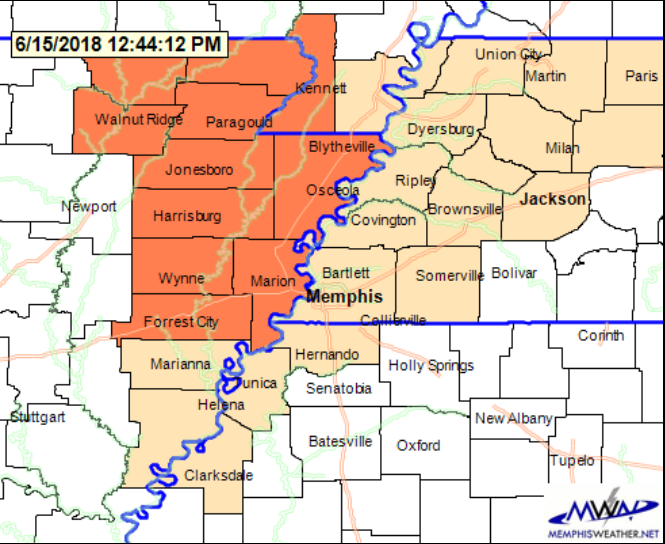 A Code Orange Air Quality Alert (AQA) is in effect for today for Shelby and surrounding counties. This means forecast ozone levels near the surface are expected to be potentially hazardous. With our light winds and very hot temperatures, this has contributed to the poor air quality. We are under a Code Orange Air Quality Alert, which means sensitive groups are the most likely to feel impacts from the air today. While this may not impact most peoples day to day activities, people should limit their prolonged outdoor activities. This especially applies to sensitive groups such as active children/adults and people with respiratory diseases such as asthma. Visit www.midsouthair.org for more information on the Code Orange and additional safety tips. While this AQA has not been extended into tomorrow yet, I would not be surprised if this continues through the weekend. Under mostly sunny to partly cloudy skies, the main story over the next few days will be our temperatures. Daily highs will creep into the low to mid 90s with overnight temps only falling into the mid 70s. Our dew point temps will stick in the 70s, which will keep our humidity levels pretty high through the weekend. With our temps and humidity levels being this high, there are some heat index concerns. 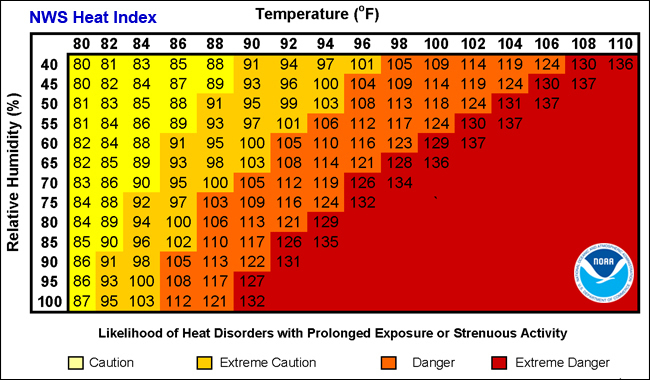 Right now, our local NWS has issued a Special Weather Statement highlighting these dangerous heat index values. For today, these values will likely coast in the 100 to 105 degree range. However, heat index values will near 105 tomorrow, so a Heat Advisory may need to be issued. 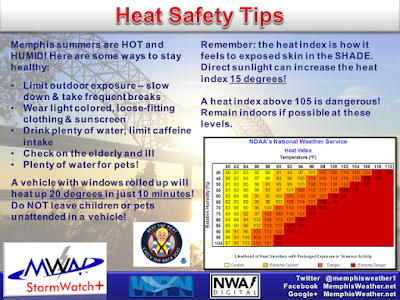 6/15 12:30 PM Update: Our local NWS just issued a Heat Advisory for northeastern Arkansas, including Crittenden County, through 9 PM tonight. 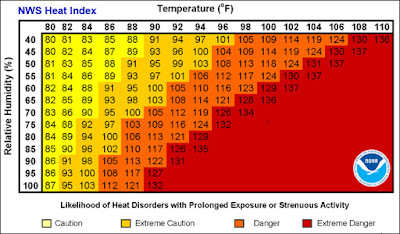 Heat index values are expected to reach 106 to 108 degrees this afternoon. Exercise caution with strenuous outdoor activities, especially in this area. Starting today through this weekend, it would be a good idea to follow heat safety tips. Limiting prolonged outdoor activities, staying hydrated, and applying plenty of sunscreen will be your best friend this weekend. The good news is that rain chances will be fairly small over the next few days. While we can't completely rule out an afternoon shower/thunderstorm with how much moisture is present, any showers that develop will stay isolated. The "best" day for these afternoon thunderstorms appears to be Sunday, but even then there is no guarantee that storms will be able to fire under high pressure. So if you do have outdoor plans this weekend, while it'll be hot, you shouldn't have to worry about rain chances until Sunday. Next week appears to be a continuation of our current weather pattern with no real relief in sight. High pressure will continue to dominate the area, although models vary as to when the ridge will begin to break down. What would this mean for us? Afternoon rain chances vs minimal afternoon rain chances. If the high pressure remains well in place, which I lean towards this happening, then our small, isolated rain chances will continue. If the high pressure begins to break down, then we may get slightly higher rain chances each day. Regardless, high temps appear to remain in the low 90s into next week. Dew point temps look to coast in the low 70s, which will keep our humidity levels pretty high. Overnight temps will fall into the mid 70s, so we won't have much relief then as well. Overall, stay hydrated this weekend and into next week folks. It'll be hot, but at least outdoor plans shouldn't be hindered by any rain. As always, if our AQA is extended or a Heat Advisory is issued, we will be sure to let you know on our social media platforms. Storms and heat and humidity...Summer in full swing. The typical summer time pattern of afternoon pop-up storms is going to come into full swing over the next few days. This is thanks to a strong high building up over the Atlantic, working to pump Gulf Moisture into the Mid-South (and much of the eastern US). With so much moisture available, combined with the ample day-time heating brought with the summer, it is no doubt that afternoon storms are possible each day. A weak front mid week won't bring a temperature change, but it will bring an increase in rain chances. Also, just to make things a little worse, more moisture being brought in means that there will be more humid conditions, so heat indices through this week will be near the triple digits every day...so much for that little streak last week when we had dewpoints in the 60s and it was slightly less humid! For this afternoon, there is the chance of a few pop-up storms. The coverage should not be too widespread (that will be coming Tuesday). 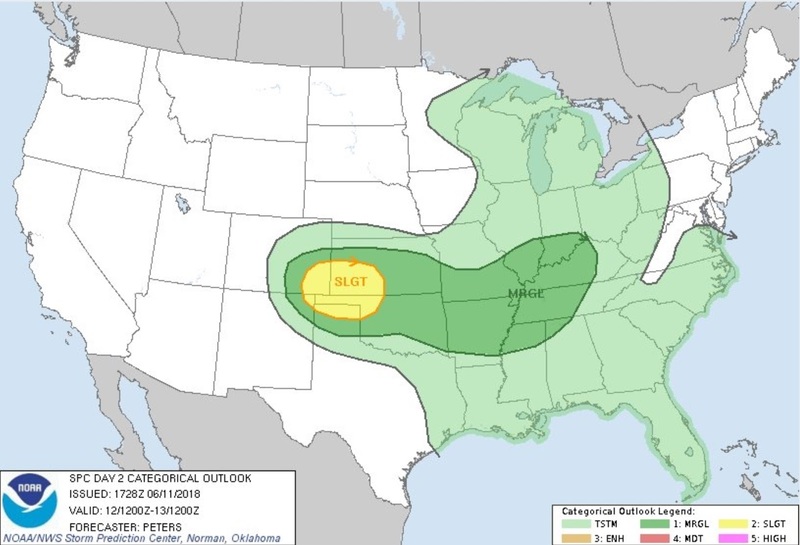 It is a tough call to know where storms will pop-up today since there are no major boundaries to fire-off convection. The good news with these storms is that they should provide some heat relief if anyone is lucky enough to catch one. Highs this afternoon top-off in the mid 90s but heat indices will be near 100. Tonight, any isolated storms left over from the evening will be quickly wrapping up with a few clouds hanging on. Low of 75. Rain chances increase for Tuesday and Tuesday night. A weak front will be creeping towards the Mid-South during the day. 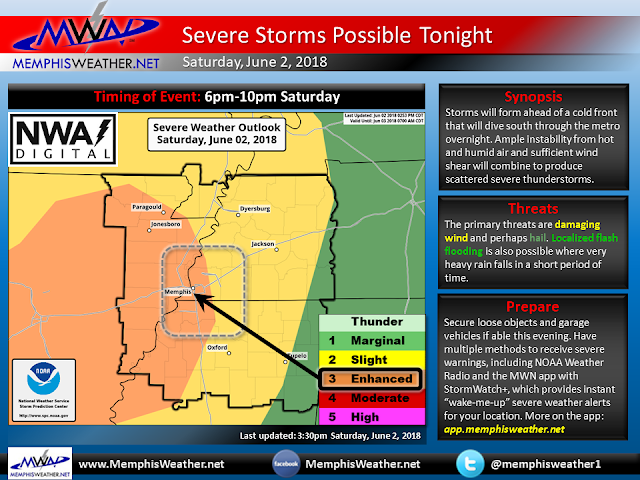 Available conditions that these storms will have to work off of do bring the concern of some stronger storms for the Memphis area. Right now, the greatest risks with these storms will be damaging winds and small hail (along with heavy rain and frequent lightning). Convective development will take place ahead of the front moving and will last through the afternoon into Tuesday evening. 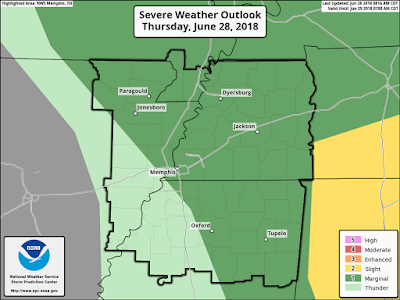 This has lead to the Storm Prediction Center issuing a Marginal Risk (level 1/5) for severe weather that includes Memphis. What we expect is a chance of a few isolated showers and storms late in the morning, then storm chances increase in the afternoon and can last into the evening. A few storms could bring with them the threats listed earlier and may warrant a few Severe Thunderstorm Warnings. Highs for Tuesday will only climb into the low 90s, but the humidity will be the real issue, keeping heat indices near 100. Meanwhile, Tuesday night shower and storm activity decreases as skies remain partly cloudy but a low chance of rain lingers overnight with the front nearby. Temps dip down to the mid 70s. With the front still lingering, showers and storms will again develop for Wednesday; however, the severe threat decreases. Convection will start to fire off during the morning and last through the afternoon into the evening. Shower and storm activity will be more widespread like Tuesday, rather than a typical summer-time afternoon. Highs continue to drop slightly since Wednesday we top off only around 90. As always though, the humidity gets us and we will still feel like the upper 90s. Wednesday night we again have a low in the mid 70s with partly cloudy skies that should turn to clear by the early morning. 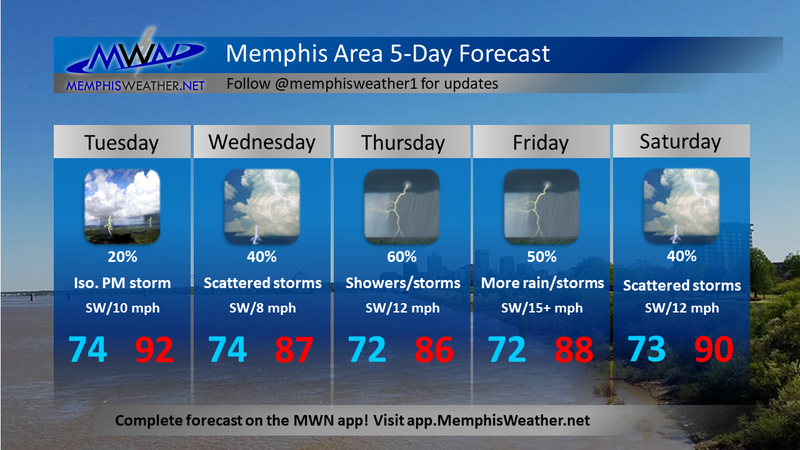 After we get past Wednesday, the rest of the work week dries up some, but not fully. Both days we see the chance for isolated pop-up showers and storms in the afternoons (not on the same scale as what we will have Tuesday/Wednesday). The front from Tuesday/Wednesday by this point has moved out and our highs start to climb. Thursday we see highs in the lower 90's and Friday we return to the mid 90's. Friday, with highs back in the 90s, combining with the humidity, heat indices will be climbing to the 100 mark again. Night time lows will be remaining in the mid 70s with partly cloudy-mostly clear skies. The story for next weekend is a broken record with conditions almost exactly like Thursday and Friday. Highs will be locked in the mid 90s and lows each night will still be in the mid 70s. With sufficient pull from the Gulf, humidity will remain high through the weekend and we continue to see the chance for isolated pop-up storms each afternoon. Heat indices, as you can probably guess, will still be in the upper 90s to near 100. 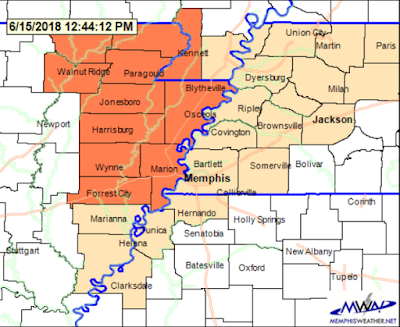 The Memphis area briefly reached Code Red for poor air quality late this afternoon, though that expires at sunset. However, yet another Code Orange Air Quality Alert (AQA) is in effect for tomorrow for Shelby and surrounding counties. This AQA is due to the forecast ozone quantities in near-surface air. What does this mean? Well, since wind is light and temperatures are very hot, whenever ozone pollutants are created in the atmosphere they don't get pushed out of our area, hence increasing the amount of ozone that hangs around. 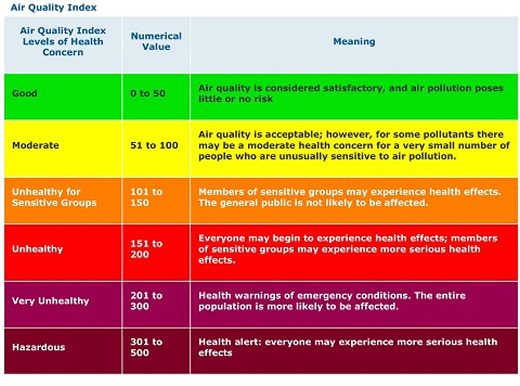 Air Quality is ranked numerically, but also with a color code. Orange and higher becomes problematic for those with difficulty breathing, and even the general population. While this may not impact your day to day living, it is recommended that you limit prolonged outdoor activities, especially for sensitive groups such as active children/adults and people with respiratory disease such as asthma. Visit www.midsouthclearair.org for more information on the Code Orange and additional safety tips. Fairly quiet conditions will continue now through the first half of this weekend as our overall weather pattern continues to be dominated by a high pressure in the Ohio River Valley. Winds have shifted to become more southerly, which has added that additional mugginess factor into the forecast. Highs will glide into the low to mid 90s for the remainder of the week with dew point temps coasting into the upper 60s. This will allow heat index values to reach near 100 by Saturday. Temps will fall into the low 70s each night. 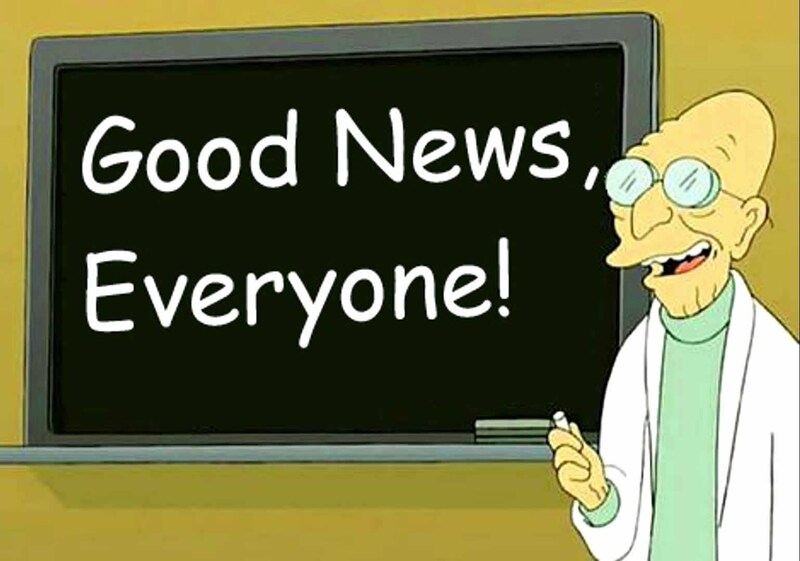 The good news for the forecast period is we will have sunny skies through the first half of the weekend, without any of those pesky afternoon shower chances. If you have plans now until Saturday, enjoy the sunshine! It may be hot and humid, but it'll be nice to have a few more days with no rain chances for a change. 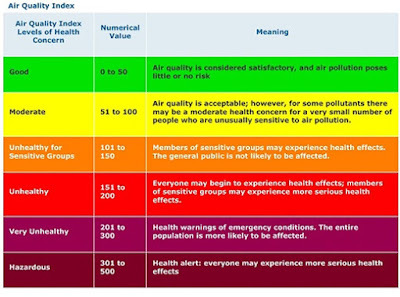 Just make sure you are paying attention to the air quality levels and take precautions as necessary! Our minimal rain chances could only last so long as moisture continues to be pushed into the area to begin next week. With southerly winds remaining, plenty of moisture will aid in our dew point temps continuing to rise, which brings in those scattered showers and thunderstorm chances each day. Additionally, temps will remain above average through the beginning of next week. Highs look to top off in low 90s with overnight temps falling to the mid 70s. The remainder of next week looks to be characterized by similar temperatures and more moisture, which will bring up those rain chances each day. It has been nice to have a week without scattered afternoon showers/t'storms. However, the general summertime trend will likely return next week. Severe weather potential tonight, then a reprieve from the heat! After the third coolest April on record, May did a "180" on us and soared to the hottest on record. Only a single day during the month averaged below normal and that was early in the month, and by only a single degree. It wasn't record-breaking heat every day (though 3 daily records were set or tied), but definitely persistent. June has continued the trend to this point, but relief is in sight after one more hot and humid day! Today's high will be in the mid 90s with plenty of sunshine and humidity levels that put heat indices just shy of the danger range of 105°. We highly recommend frequent breaks in the shade if outdoors today, as well as plenty of sunscreen and water. By this evening, a cold front will be surging southeast from the Plains into the Mid-South. Ahead of it large clusters or line of storms will form and crash into the unstable air caused by today's heat and humidity. One of these complexes of storms will move across AR into west TN and northwest MS this evening. The instability, sufficient wind aloft, and cold air spreading over the very warm low levels will combine to produce a threat of damaging wind and hail in tonight's storms that should last no more than an hour at any one point. As of 3:00pm, areas from the greater metro into AR are under an Enhanced Risk (level 3 of 5) of severe weather, while areas east of the Bluff City are in a Slight Risk (2/5). More details can be found in the graphic below, but don't worry much about where the line is drawn between levels 2-3. You still need to prepare for a decent chance that severe storms will arrive this evening. Updating once again as it now is starting to appear that storms growing in AR *might* bypass the metro to our southwest. However, another developing cluster in southern MO could still affect us, but with a later ETA - likely after 10pm - and perhaps with less impact. Continue to remain weather aware, particularly if the earlier storm system does indeed move through the metro. Follow us on our social media platforms for the latest. 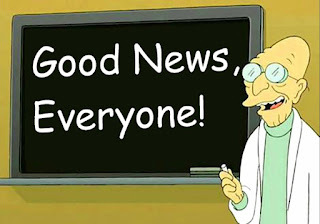 Links are provided at the end of the blog. We recommend not only having multiple ways to receive severe weather warning information (including our MWN Mobile app with StormWatch+), but securing loose objects outdoors like pool toys, garbage cans, lightweight grills, and even small animals or children, and garaging vehicles if able. The tornado threat is not concerning during this event, but there is a 30% chance of wind over 60 mph and a 15% chance of hail of 1" or greater within 25 miles of you this evening. 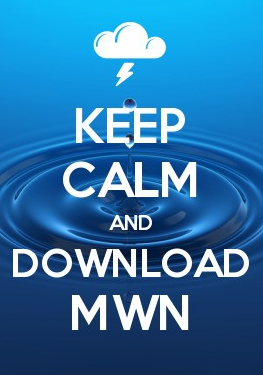 If you have evening plans outdoors, keep a close eye to the sky and on radar in your MWN app! Relief from the persistent heat, at least temporarily, is spelled C-O-L-D F-R-O-N-T, and that front will be south of us by Sunday morning. Mostly sunny skies are expected with a gusty north wind averaging 10-20 mph ushering in cooler, and more importantly drier, air into the region. The absolute amount of moisture in the air is measured by the dewpoint. We've had very uncomfortable dewpoints in the lower 70s for several days. Sunday's afternoon dewpoint is forecast in the mid 50s! Now that's something to take to church tomorrow! The cooler dewpoints stick around through the middle of next week, meaning more comfortable conditions, despite near-average temperatures - highs in the mid to upper 80s and lows in the 60s. A fly in the ointment is upper level energy that moves by to our west on Tuesday. It could increase clouds a bit, but no rain is currently predicted through the middle of next week. Enjoy it - we've all earned this bit of early summer relief!